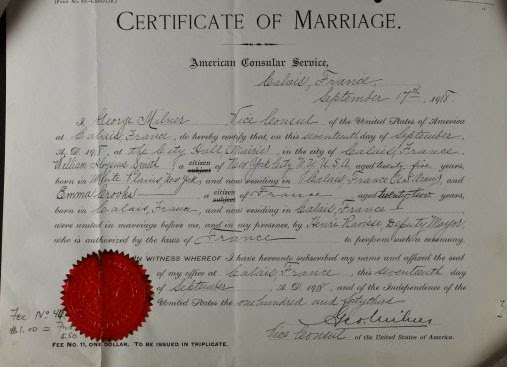 Did Your WWI Veteran Marry Overseas? 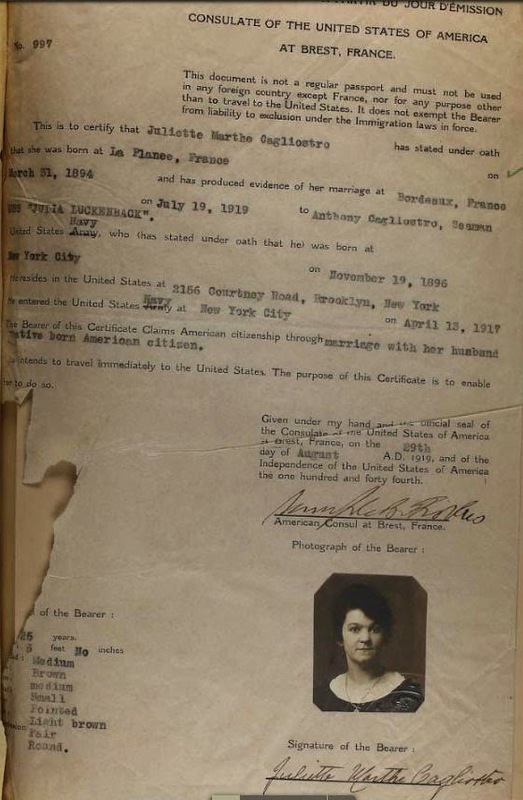 There are plenty of WWII sources for researching war brides, but a WWI search can be challenging in the USA.Over ten thousand American soldiers married overseas during WWI. So how can you find your ancestors' records? “War bride” is the common term used to define foreign marriages of soldiers. These marriages took place overseas, and since the law stated “women could be American citizens by marriage,” these newlyweds were protected and transported to America by the American Government. Reference Female Ancestor Citizenship Confusion? Part II. 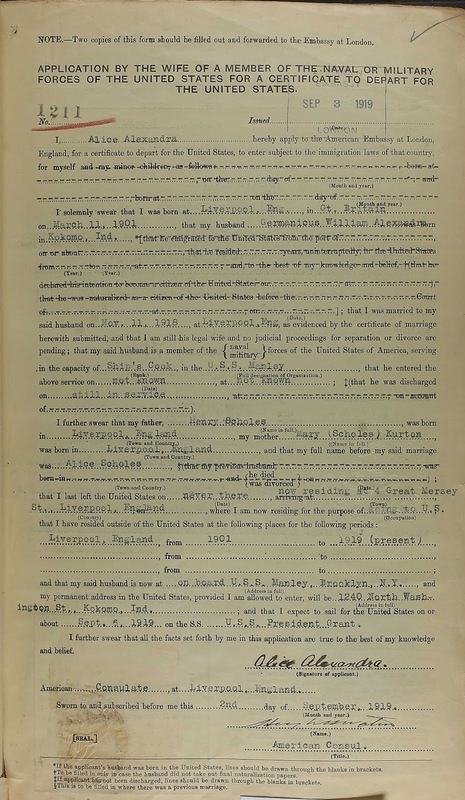 An Application by the Wife of a Member of the Naval, or Military Forces of the US for a Certificate to Depart for the United States gives in-depth genealogical information of your ancestor. 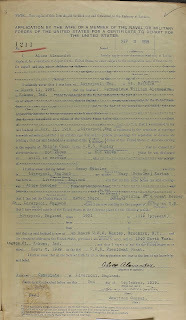 Ancestry.com has digitized a collection of "Applications of Wives of Members of the AEF in Europe, 1919 - 1920. This collection is part of the US Consular Posts. Emergency Passport Applications issued to brides for US Transport may also assist in learning more. And may even hold a photo of the bride. For more information read Passport Applications. You may locate the ship manifests that recorded the bride and even children born overseas. Begin your search with the Ellis Island ship manifests. Researchers often bypass the task of looking for an overseas marriage license. But this license holds a wealth of genealogical data on both your veteran and the bride. Be sure to scour your veteran's service record; but it may also be attached to the brides passport or naturalization record. Be sure to read 12 Resources for Researching WWI Overseas Marriages for more information and a comprehensive list of research tips. Thanks for this post Kathleen. I have a WW1 war bride in my tree. Have found her in a ship manifest for her initial trip to America. But these other resources I will need to research. Thanks for providing the options that I need to consider! GG Grandfather's military records and govt records. You may find something about him on Fold3.com. A copy of his marriage license may be in his military record. Be sure to check all the collections in this post.